How to save on average $5,000-$14,000 when selling or buying your home. What are my savings with The Castillo Group? 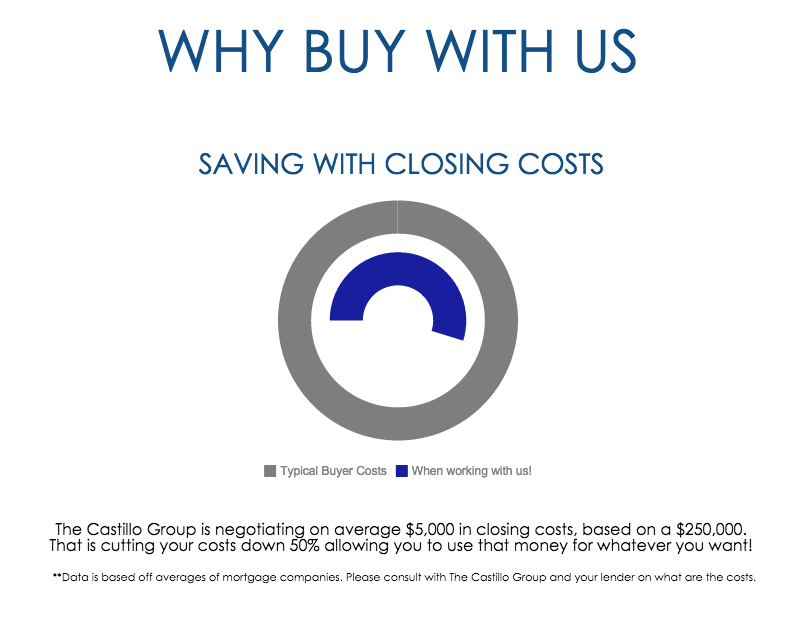 The Castillo Group prides itself on saving our clients the most amount of money possible when it comes to selling or buying their homes. 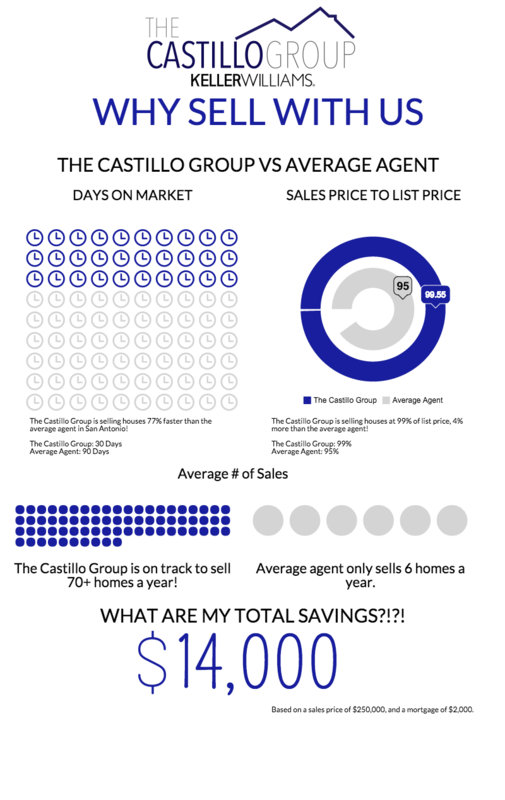 On average, The Castillo Group negotiates 99% of the list price of homes for our clients when most other agents average only 95% of the list price. Thanks to our unique negotiation techniques, that four percent we save our clients can mean up to an extra $10,000* in your pocket! Not only do we save you money, but we also do it quickly! In fact, we sell our houses about 77% faster than the average agent in San Antonio. Most homes in San Antonio are on the market for an average of 90 days. Our homes, only 30 days. Just think: that’s two months of mortgage you no longer have to pay since your home was sold faster than if you were working with the typical agent. Pretty cool, huh? It’s not just about saving money when selling your home. We save our clients money when it’s time to buy, too! Our priority is to make certain that you as a buyer secure of the home of your dreams. Once that happens, saving you money is just the icing on the cake that makes the whole process just that much sweeter. We’ve been able to secure, on average, an extra $5,000 in closing costs for our buyer clients. What would you do with that amount of extra cash in your pocket? Buy furniture, appliances, put it in savings? It’s your choice! *Based on the average sales price of a home in San Antonio, which is $250,000. ARE YOU BUYING AND SELLING? CLICK HERE AND FIND OUT ABOUT OUR MOVE PROGRAM WHICH SAVES SELLERS WHICH SAVES OUR SELLERS ON AVERAGE $2,500!